I remember one of the things that hit me hardest when Autism was first mentioned nearly two years ago, was the theory that Autistic children lack imagination, I can remember feeling terribly sad thinking how do you play without imagination? Recently I have noticed on numerous occasions Lachlan playing in imaginative ways, I have seen him line up my washing baskets, then sitting himself in the front one, happily shouting “chop-choo, woo-woo”, I have watched him crawl around the floor going “woof-woof” I have seen him make “ice-cream’s” with both play doh and sand, handing them out to us all, with a “yum-yum”. Lachlan frequently pretends to be asleep, making sleepy noises, being a spaceman or rocket and shouting “5-4-3-2-1-BLAST-OFF” while jumping off something is a long-standing favourite, making cups of tea in the bath and building houses out of anything and everything from Lego to lumps of wood, Lachlan does it all. 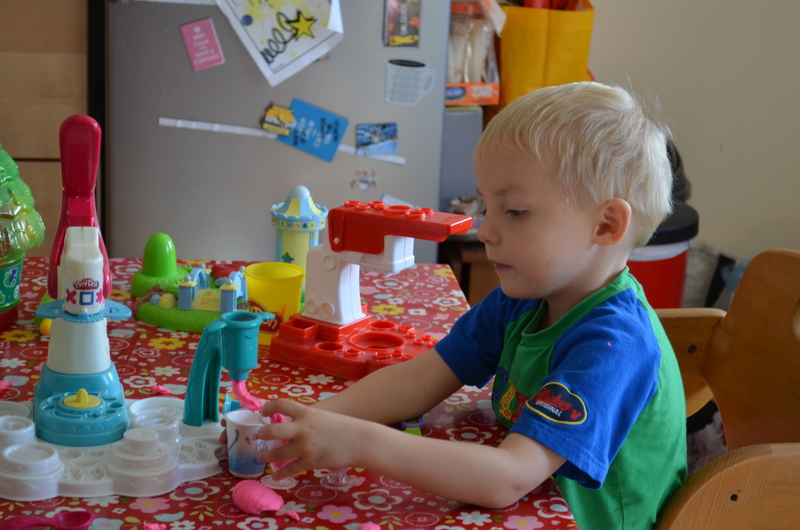 I want to share what happened one afternoon last week while Lachlan was enjoying some free play time with his play doh. Lachlan was sitting at our kitchen table with the play doh ice cream factory, happily making cones as he has done on lots of occasions recently, next thing Lachlan is digging in the large box we store all the playdoh stuff in. We have a fair collection as I never got round to clearing out the bits Alex had finished with, so out of the box come the characters from In The Night Garden, one by one Lachlan lines them up along the edge o the table. Upsy Daisy, Iggle Piggle, Macka-Packa and the Tombliboos they are all there, next Lachlan gets a large lump of purple play doh, he sits it on the table, to the lump he adds small pink dots of play doh to the top, all the while I am watching curios as to what Lachlan is up to and watching that none of the play doh is swallowed! What Lachlan did next had me stunned, delighted and yes it brought tears to my eyes! I threw my arms round Lachlan and replied, ‘yes darling, you have given Upsy Daisy a party, a Birthday party”. All this was witnessed by Lachlan’s speech therapist who was as stunned and delighted as I was. ← Sometimes it’s all just too much…….